i know, it's not even thanksgiving yet, but "Rudolph The Rednose Reindeer" has already been heard in our car (the peppy Ella Fitzgerald version) recently. our daughter doesn't think seasonally; she was at one point happy to sing "Frosty The Snowman" before bedtime for a year straight. Julian Koster is currently on a "caroling tour" and if you have a chance to host Julian and his saw at your house, don't miss it! Songs, stories, it's a great evening for young and old. 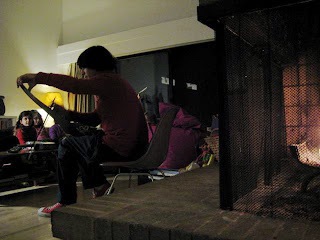 Go here for Julian's remaining cities and here at the Music Tapes site for info on how to have him carol at your house. The 'fork has a good review of the album Julian and his saws just released of instrumental christmas tunes, Merge's first seasonal release and one of the more spooky and dislocating holiday listens for sure. 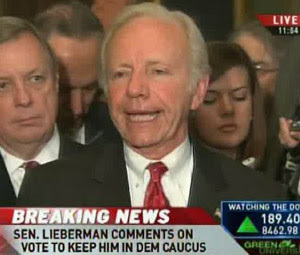 Dems in Congress continue to display the spinelessness that's carried them through the last two years of an extremely unpopular Bush administration by forgiving an extremely unpopular Joe Lieberman for enthusiastically campaigning against their own candidate for President. Depressing. Ornette Coleman played Memorial Hall at UNC last night with his most recent quartet which includes his son Denardo on drums plus Tony Falanga on acoustic bass and Al MacDowell on electric bass...i was just excited to see the man in person for the first time and would have settled for little, but no need for that, it was amazing. frankly i got worried when i saw the electric bass, but MacDowell played it like a guitar and the interplay between him and Falanga, who was a powerhouse on his upright, was really spacious and cool. Ornette sounded great, he sounded like Ornette, and the setlist was a kind of career retrospective and made it clear what a thing he has honed over the years as his own voice despite the fact that his settings and lineups have changed so often. He saved Loney Woman for the encore and it was a moving, great way to go out. pictures like this continue to blow my mind. 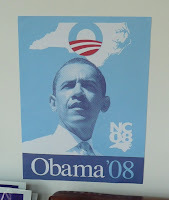 we all kinda knew it since yesterday morning, but all the news orgs are now announcing that Obama won NC on Tuesday, first Dem to do so since Carter. obviously Tuesday night was huge, but now the victory feels real! still trying to wrap my mind around PRESIDENT OBAMA! but it sounds awesome. saturday's NC Rocks for Change early vote concert on the UNC campus was great fun, with perfect weather and an awesome lineup, plus big crowds all day, including a hardy group when i went on solo at 9:15 AM or so, all the way through to the dB's rousing closing set ending around 2 PM. pictured here - Billy Bragg, the dBs (w/ Mitch Easter on bass! ), Ivan Rosebud, Megafaun, and Regina Hexaphone. the coffee, donuts, soup, and apples kept the masses fed, and everyone sounded great, though the highlight might have been Billy Bragg's inspiring between-song talks about the future, the international view of the US, holding Obama to his word should he win, and faith (not the religious kind) in general.